From the outspoken former governor, presidential candidate, and chair of the Trump transition, a no-holds-barred account of Christie’s years atop the national political scene—his rise to power through the bare-knuckle politics of New Jersey, his fifteen-year friendship with Donald Trump, and his frank insights and experiences with the president and his inner circle. The famously candid two-term governor of New Jersey, Chris Christie was the first major official to endorse Trump for president. Christie quickly became one of Trump’s most trusted advisers, tapped with running Trump’s transition team and nearly being named vice president. Within days of Trump’s surprise victory, however, the president-elect booted Christie from the transition team, citing the Bridgegate scandal. 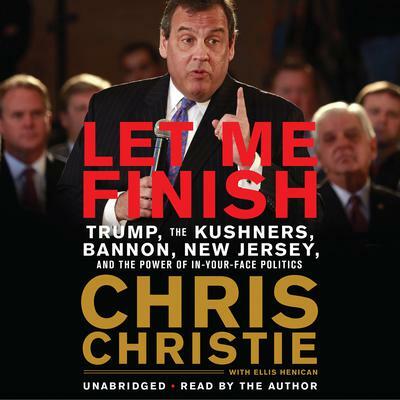 In Let Me Finish, Christie sets the record straight about his tenure as a corruption-fighting prosecutor and a Republican running a Democratic state, as well as what really went down inside Trump Tower. Christie will take readers into the ego-driven power struggles among the top advisers competing for Trump’s mercurial attention, figures like Steve Bannon, Corey Lewandowksi, Reince Priebus, Kellyanne Conway, Paul Manafort, and Jared Kushner, Trump’s son-in-law who never forgot that Christie was the prosecutor who put his wealthy father behind bars. Packed with news-making revelations and told with an entertaining bluntness that few politicians can match, Christie’s memoir will be an essential lesson in Trump-era realpolitik. Chris Christie is an American politician, former United States Attorney, and political commentator who served as the fifty-fifth governor of New Jersey from 2010 to 2018. During his tenure, he chaired the Republican Governors Association and President Trump’s Opioid and Drug Abuse Commission. Christie became an ABC News contributor in 2018 after leaving office.